This entry was posted in Wildlife and tagged Blue bird, Forester Artist, nature, photography, wildlife by foresterartist. Bookmark the permalink. What a sweet photo. I always love seeing blue birds because they are my mom’s favorite. And your title reminds me of an old Goldie Hawn movie. I’m gonna have to go dig it out and watch it now! Glad to hear it, “this one’s for you Mom!” Enjoy the movie, love Goldie. Love it. Great colors. And yes to why not! Indeed, you can’t go wrong with a blue bird! I love the colors! Great picture. 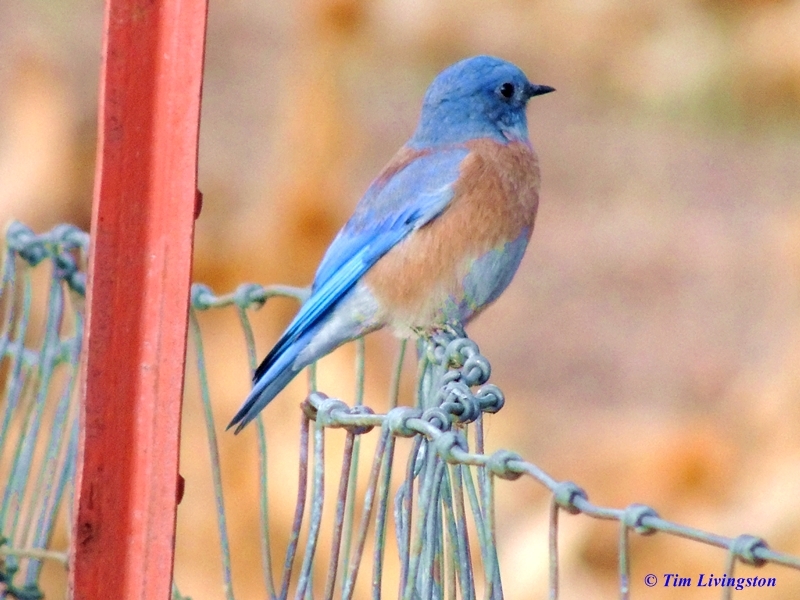 Great shot of the Western Bluebird. In the 70’s and 80’s I had an Eastern Bluebird nesting box project that I managed on my own. Had about 50 plus boxes in several rural areas. No one took over my project when I returned to work but it did incease the bluebirds for awhile. Thank you Yvonne. How fun to work on a project like that and to see good results. What a beautiful thought Annerose, and so true. My gosh – what a heavenly photo – especially with the slash of red. I would SOOO make a drawing of this if I had taken it. Thank you Julie. You are welcome to make a drawing of it if you like. Hi Tim .. I love your little Blue Bird sat atop the wiggly wire fence ! Thank you Poppy. When I took the picture I didn’t like the fence. Later, I looked at it again and I really liked the fence. A happy accident! I had not heard that before. Will the sparrows kill young bluebirds? Thanks Doron. I did have a great weekend, it must be because you wished it so! What a beautiful picture of a blue bird.